I am more than excited that I’m going back to Bali in April, for so many reasons. One of my favorite things about Bali is the restaurants in Ubud. The food there is so healthy and delicious. The Ubud restaurants are really like nowhere else on earth. Here are the restaurants in Ubud that I’m looking forward to going back to. If you want a true Bali experience with a setting in the rice fields, go to Sari Organik. They have delicious, healthy, organic farm-to-table cuisine and fresh juices. Most of the food comes from the restaurant’s own farm. Go at sunset for the best views. The food at Bali Buda is fresh, nutritious, and vegetarian, with many vegan and gluten-free options. They also have a great choice of fresh juices, kombucha, and homemade ice cream that’s to die for. Hint: Choose the raw cacao. One thing to note, there is no wi-fi at Bali Buda. Juice Ja has a variety of organic vegetable and fruit juices, wheatgrass shots, as well as salads and sandwiches. It’s a nice place to hang out and relax with a book, or meet other travelers. I highly recommend any of the juices that include turmeric. I like the fresh tuna salad the best. Kafe is owned by Yoga Barn and is the meeting place for yogis and alike. They have a huge choice of fresh juices and smoothies, as well as a delightful menu. The staff is friendly and it’s a very relaxed place. This place stays busy, and is a great place to meet new people. Reservations are a must at The Melting Wok, as the place is small. They specialize in curry and fried noodles. The fusion of Thai, Laotian, and French flavors and flair make this place a wonderful spot to eat. The staff is very welcoming and attentive. Don’t miss the crème brûlée. The view over the gorge and the decor is fabulous.Indus Restaurant is owned and operated by an Australian women and reflects the true Balinese culture mixed with modern western cuisine. The beef curry is fabulous. Cafe Seniman is more of a coffee shop than a restaurant, but they definitely deserve a mention on this list. They have the best coffee in Bali. Their cold drip coffee is perfect for the heat, and if you aren’t a coffee drinker, they also have a great green cleansing juice each day. The wi-fi is some of the best in Ubud. They have their own micro-roastery, so you know you are getting the freshest beans around. They also serve all day breakfast and have excellent cakes and desserts. Bali is known for its duck, and Bebek Bengil-Dirty Duck Diner is the place to get it. Bali ducks are small, so one person can easily eat a whole duck. Wander around in the rice fields out back for some great photos. 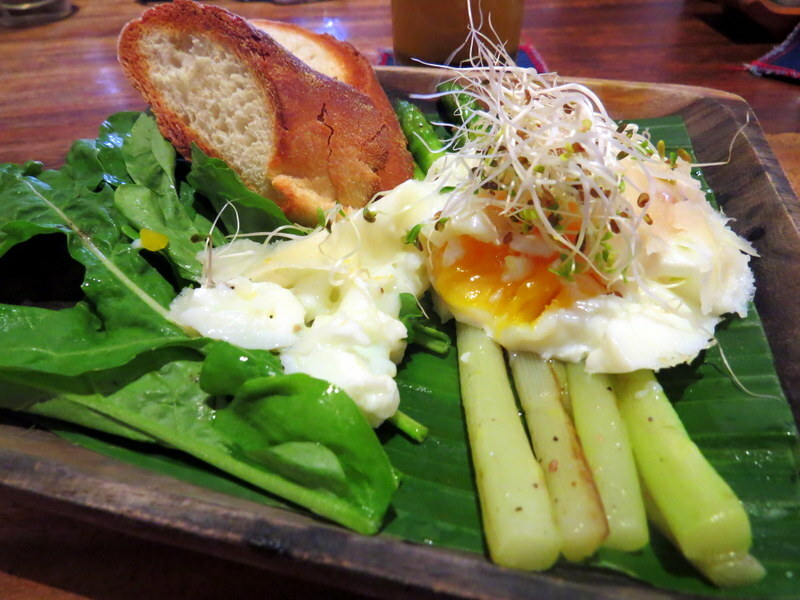 The Seeds of Life specializes in clean vibrant living foods, and fast became one of my favorite restaurants in Ubud. I have never had raw food that was so delicious and prepared so beautifully and with such care. 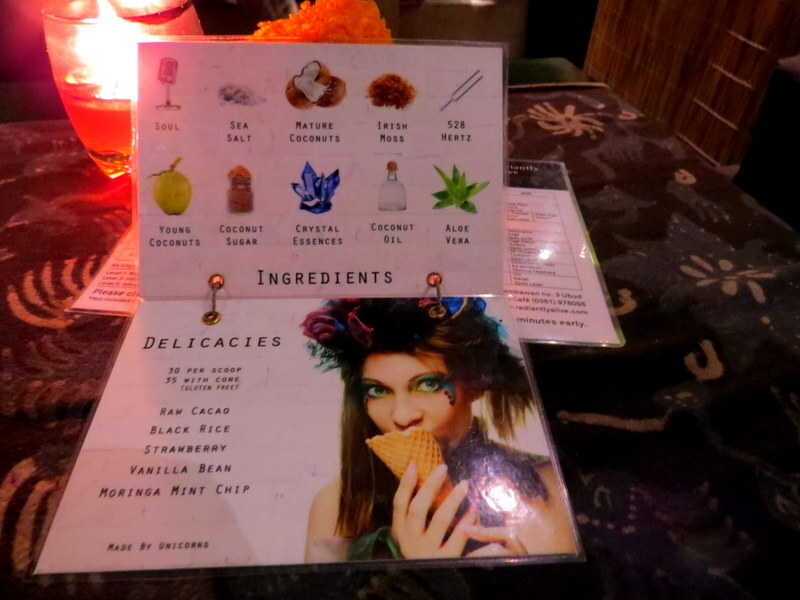 They have incredible teas, tonics, and elixirs and some of the best desserts around. My favorites were the Mexican lasagna and the raw pizza.